Over its 60-year history, DARPA has played a leading role in the creation and advancement of artificial intelligence (AI) technologies that have produced game-changing capabilities for the Department of Defense. Starting in the 1960s, DARPA research shaped the first wave of AI technologies, which focused on handcrafted knowledge, or rule-based systems capable of narrowly defined tasks. While a critical step forward for the field, these systems were fragile and limited. Starting in the 1990s, DARPA helped usher in a second wave of AI machine learning technologies that created statistical pattern recognizers from large amounts of data. The agency’s funding of natural language understanding, problem solving, navigation and perception technologies has led to the creation of self-driving cars, personal assistants, and near-natural prosthetics, in addition to a myriad of critical and valuable military and commercial applications. However, these second wave AI technologies are dependent on large amounts of high quality training data, do not adapt to changing conditions, offer limited performance guarantees, and are unable to provide users with explanations of their results. 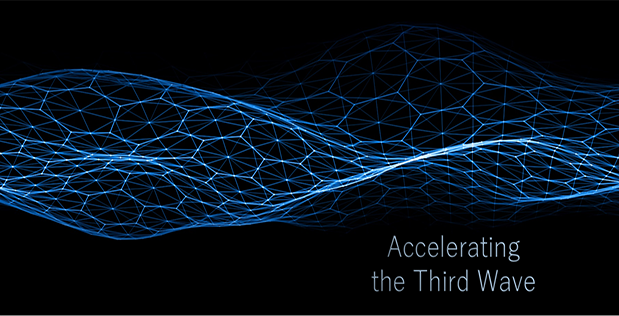 To address the limitations of these first and second wave AI technologies, DARPA seeks to explore new theories and applications that could make it possible for machines to adapt to changing situations. DARPA sees this next generation of AI as a third wave of technological advance, one of contextual adaptation. To better define a path forward, DARPA is announcing today a multi-year investment of more than $2 billion in new and existing programs called the “AI Next” campaign. Agency director, Dr. Steven Walker, officially unveiled the large-scale effort during closing remarks today at DARPA’s D60 Symposium taking place Wednesday through Friday at the Gaylord Resort and Convention Center in National Harbor, Maryland. DARPA is currently pursing more than 20 programs that are exploring ways to advance the state-of-the-art in AI, pushing beyond second-wave machine learning techniques towards contextual reasoning capabilities. In addition, more than 60 active programs are applying AI in some capacity, from agents collaborating to share electromagnetic spectrum bandwidth to detecting and patching cyber vulnerabilities. Over the next 12 months, DARPA plans to issue multiple Broad Agency Announcements for new programs that advance the state of the art in AI. Under AI Next, key areas to be explored may include automating critical DoD business processes, such as security clearance vetting in a week or accrediting software systems in one day for operational deployment; improving the robustness and reliability of AI systems; enhancing the security and resiliency of machine learning and AI technologies; reducing power, data, and performance inefficiencies; and pioneering the next generation of AI algorithms and applications, such as “explainability” and commonsense reasoning. In addition to new and existing DARPA research, a key component of the campaign will be DARPA’s Artificial Intelligence Exploration (AIE) program, first announced in July 2018. “In today’s world of fast-paced technological advancement, we must work to expeditiously create and transition projects from idea to practice,” said Dr. Walker. Accordingly, AIE constitutes a series of high-risk, high payoff projects where researchers will work to establish the feasibility of new AI concepts within 18 months of award. Leveraging streamlined contracting procedures and funding mechanisms will enable these efforts to move from proposal to project kick-off within three months of an opportunity announcement. For more information about AI Next, please visit: http://www.darpa.mil/work-with-us/ai-next-campaign. Associated images posted on www.darpa.mil and video posted at www.youtube.com/darpatv may be reused according to the terms of the DARPA User Agreement, available here: http://go.usa.gov/cuTXR.